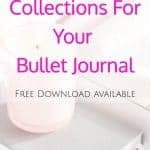 Bullet journal collections are fun to create and help you to organize your life. 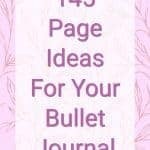 I’ve found 145 things you can track in your bullet journal for home, health, finance, blogging, self improvement, and fun. One of my favorite things about keeping a bullet journal is all of the different things you can track and collect. A bullet journal collection is usually a list of things you collect or want to keep track of. It can also be so much more! I think of a bullet journal page as somewhere I can store lots of things I want to remember later. Here is the journal I recommend and use. 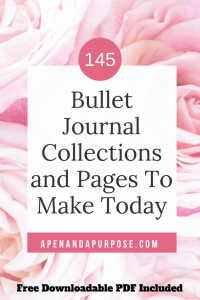 There are a ton of bullet journal collection ideas in this post but you can come up with so many more bullet journal list ideas to add. The sky is the limit and the cool thing is you get to individualize your journal to fit your needs. Why Use Collections in Your Bullet Journal? The simplest reason why you should use collections or lists in your bullet journal is because it helps you remember things. Having a collection or list you can refer to lets you know what books you’ve already read, what foods fit your diet, or whatever your heart desires to track in your bullet journal. When you take time to list things such as “things I like to do when I’m bored,” it gives you a moment of mindfulness to focus on your life. A bullet journal collection can also be added to as needed. For example, I used to have a journal dedicated to my reading goals for the year. I tracked which books I read and how many I read each year. This required me to remember to enter the books into my journal when I completed a book. Since I have my bullet journal with me all the time, it is easy to pull it out and update when I complete a book. Since a bullet journal has an index, it’s easy to add to or reference your bullet journal collections when you need to. No more looking everywhere to find where you wrote that list! Everything is with you in one place. Want to look up the shows you want to watch on Netflix? Just pull out your bullet journal and flip to that page! 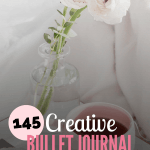 See my post on how to start your own bullet journal here. An effective part of any diet plan is tracking. People tend to underestimate the amount of food they eat but once they write down the food they eat they are better able to follow a diet plan. For more information, see my post on using a bullet journal for weight loss). Tracking helps more than just with diet plans. For example, have you ever gone to take your medication but then questioned whether you already took it? This happens to me all the time! I don’t want to take extra medication so then I don’t take it. I bet I miss a lot of doses because of this! Tracking in your journal can help you with this. Who Would I Be If I Were Successful? How Would I Feel If I Were Successful? What Would I Be Doing If I Were Successful? I have a terrible memory so it is important for me to be able to track things like what I’m subscribed to, books I’ve read, daily tasks, and all sorts of things like that. Yesterday I created a post on Netflix shows to binge because I like to do that while I cross stitch. Here are some examples of things to create as collections in your bullet journal. I originally started bullet journaling to manage my blog and work. Having a bullet journal to track your progress and keep track of all of your tasks is helpful in creating success. And then there is money! Whether you are saving towards something, trying to stop spending, tracking bills, whatever you need in your life…you can put it in your planner and make it top of mind every day. When you create your collections the best way to organize them is by making sure you track them in your index. The bullet journal index acts as a table of contents, allowing you to quickly find what you’re looking for. The journal I use has preprinted page numbers on each page so I can quickly add page numbers to my index. There are times when my collection becomes larger than the space I allow for it. What I do there is just start a new page. Then on the index, I add the page number. So, let’s say I started a collection of books I read this year on page 13 and only allowed one page, but then I end up reading more books… The next page in my bullet journal is page 53 so I would continue my book collection there. On my index I would write Books Read 13, 53. Another idea is to write on page 13/53 on both pages near the page number so I know this collection is also on another page. So there you have it! I hope these bullet journal ideas are helpful to you. Comment below if you have other favorite bullet journal pages I should add to the list. I am looking forward to make a list of lists to make! This made me laugh because I totally have one of these in my bullet journal. 🙂 It is the most fun list of all! I really love all the ideas for journal entries and categories. I just started bullet journaling in 2018 and have become totally obsessed with all the possibilities. I enjoyed all the amazing layouts and spreads on your blog, and I am overwhelmed! The trick is to only do the things that actually apply to you. In my post about simple bullet journals I show you what I do during busy weeks in my bullet journal. I’m currently doing this in the Scribbles That Matter journal instead of on printables so I can keep all the stickers and washi I use :).